Play Hypno-Hippo online for free now! 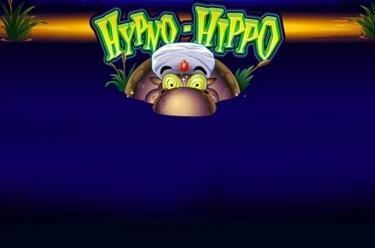 The slot Hypno-Hippo features exotic animals and offers up to 25 pay lines on 5 reels. The elephant symbol only needs to land once to grant you a win - it also scores the highest winnings. The chicken symbol is the Scatter: You win if it lands 3 to 5 times in any position on the reels. The Wild symbol Hypno-Hippo substitutes for all other symbols except A, K, Q, J and 10 and can therefore complete your winning combos. It triggers 8 free games with the Hypno-Hippo feature if it lands 3 times. During the free spins the hippo hypnotizes all animal symbols on the second, third and fourth reel. The monkey, the hyena and the elephant will then act as the chicken symbol (Scatter); in the game this is displayed by an animation in which the animals behave like chickens. The animated symbols act as Scatter symbols and complete combos with other Scatter symbols! 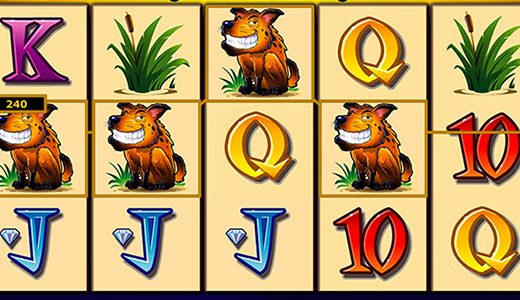 Free games are played with stakes and line numbers of the regular game; further free spins can be won during the free games. Your aim in Hypno-Hippo is to line up 5 matching symbols along one of the 25 win lines that all run from left to right. Elephants, hyenas, monkeys, chickens and a hippo that can make all the animals dance to its tune - that's Hypno-Hippofor you! Cute animals and mesmerising Twist wins await you in this slot: During the free games the eponymous hippo can hypnotize all other animals to make them believe they are chickens. What's so great about this? The chicken is the Scatter symbol, which means the more chickens appear on the reels the more Twists appear in your account!